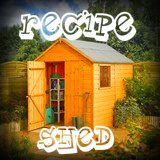 I missed @reluctanthousedad Recipe Shed theme last week because I was actually *gasp* away on holiday! (Doesn't happen very often in our house, staycations are our bag!) Am pleased to be able to join in with the theme of Vegetarian. This is a one pot dish, which takes about 20 minutes to complete plus 15 minutes standing time. It's filling, cheap and flavoursome! Spray a heavy-based saucepan with low calorie cooking spray and add the onion, garlic, ground cumin, ground cinnamon and bulgar wheat. Place over a medium heat and cook, stirring, for 1-2 minutes to lightly toast the grains. Pour the stock into the saucepan, stir well, then bring to the boil. Cover and reduce the heat and cook on a gentle simmer for 6-8 minutes or until the liquid is absorbed. Just before serving remove the lid and fluff up the grains with a fork, mixing in the red peppers and chickpeas. Carefully fold in the herbs (fresh ones are best for this recipe) and scatter over the feta cheese. You can swap the bulgar wheat for couscous or replace the chickpeas with canned mixed beans.